RHASS chief executive Alan Laidlaw, RHASS chairman Jimmy Warnock, Nina Clancy from the RSABI and RHASS honorary secretary William Gill. RHASS said the donation will help RSABI extend the support of its helpline. 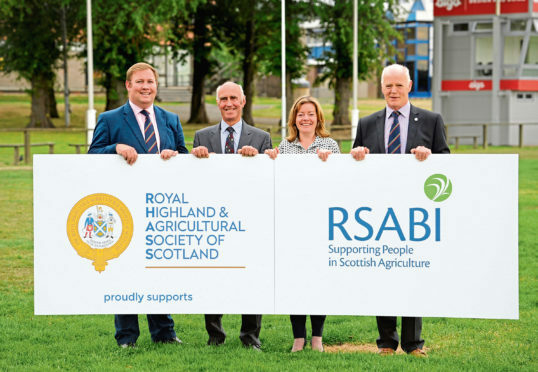 “RHASS has been supporting farming and agriculture in Scotland for over 200 years and we are delighted to be continuing that work with this funding for RSABI,” said RHASS chairman, Jimmy Warnock. RSABI chief executive, Nina Clancy, said the funding would enable them to set up an outreach programme for people that work in the sector who are isolated and lonely. The helpline – 0300 111 4166 – is open every day from 7am to 11pm.